This two-mile long ribbon of public park land green is the most significant component of the many open spaces donated by city founder William Jackson Palmer. He envisioned its creation, acquired the land, provided direction for its development, and paid the immense cost of its initial improvement. Palmer also selected the original landscape architect and worked closely with the engineer to ensure that the design and plantings proceeded according his exacting specifications.It most represents Palmer’s philosophies of park use and development, including an emphasis on preserving and utilizing existing topography, framing scenic views, employing native materials and vegetation, and most notably excluding motorized vehicles. Creation of this park was one of the largest local employment projects in the city during 1904-07. The park has served as a place of quiet contemplation as well as for active recreation over the past century. The park exhibits the work of landscape architects and planners Charles W. Leavitt, Jr. and Charles Mulford Robinson, as well as that of engineer Edmond C. van Diest. 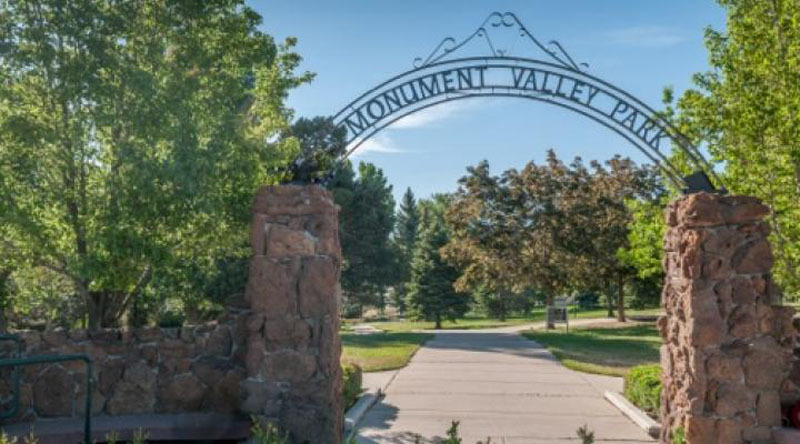 Architecturally, the Rustic style is displayed in early 20th century park resources and a number of 1930s native stone park features such as bridges, ditches, seating areas, entrances, monuments and overlooks, retaining walls). Following the 1935 Memorial Day flood, the Works Progress Administration (WPA) focused major efforts on the park. Flood debris cleanup, creek re-channeling, building and structure restoration, and the erection of new monuments and structures all provided a major source of local employment during the Great Depression.